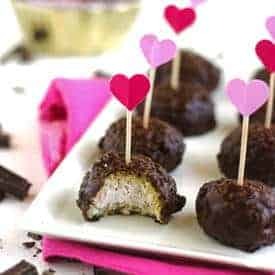 This quick and easy, chocolate truffle recipe tastes like an Almond Joy but is made with avocado, and is naturally sweetened! “Wait….these are healthy?” – Mr. Food Faith Fitness. I mean it’s not like he doesn’t generally like what I force ask him to try, these just got a little more excitement out of the man than usual. And, that made me do this —> 🙂 Hence, I decided to share my story. Anywho, now you know that they are man approved, so let’s get the ball rollin’ on the deets. You see what I did? The ball rollin’…these truffles are little balls. Ok so, These little round balls ‘o bliss have absolutely zero butter or added sugar. You are probably peering at me through questioning eyes, wondering how a truffle with no butter or sugar can actually taste, well, good and even bear the truffle name. Let me tell you how: Avocado. And now, your eyes are even more questioning and peer-y…I get it. Avocado isn’t really known for it’s ability to make truffles that you just want to face plant into forever. However, you guys know I am a fan of using avocado in baking. 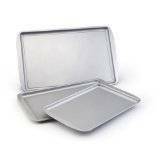 It makes some mean healthy chocolate chip cookies, gluten free brownies and, most recently, paleo mint gluten free chocolate cake. I’m a hyoooge fan of texture, and I was a wee bit worried that avocado wouldn’t be as creamy as using butter, but I was wrong. This chocolate truffle recipe is uber creamy and definitely take you on a trip to alota-chocolata-land. I don’t even know if that makes sense. Hasn’t stopped me before. Side note: Isn’t that how everything in life should be? Creamy and chocolatey? We should all live in houses with chocolate walls and cream floors. If cream makes a sound foundation for a home, I do not know. It does make a sound foundation for my stomach though. Priorities. 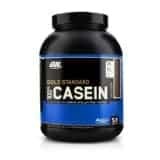 Another key player here is the chocolate protein powder. 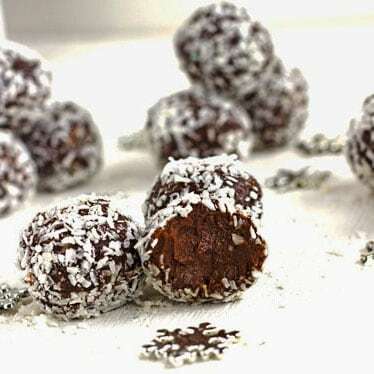 It adds an extra protein POW that makes these truffles bordering the acceptable-to-eat-for-breakfast stage. The excitement builds. 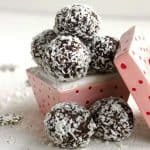 If you don’t “do” protein powder, you could totally try these paleo chocolate truffles from What the Fork! 3) You can throw them at people. I wouldn’t really recommend the final point. But, it would be fun right? Maybe that’s just me. Did I even mention how ridiculously easy these are? I am almost embarrassed to call something that goes along the lines of: blend stuff up, refrigerate it and then roll it around in more stuff, a recipe butttt I’m doin’ it. Blend the avocado in a food processor until it is very smooth. Add in the protein powder, vanilla extract and almond extract and blend until well combined. In a medium, microwave safe bowl microwave the chocolate chips for about 1 1/2 minutes, stiring every 20 seconds, until the chips are melted. Add the avocado mixture into the bowl of melted chocolate and stir very well until the chocolate is mixed well. Cover the bowl with saran wrap and refrigerate for 2 hours. Line a cookie sheetwith waxed paper, and place the sweetened coconut flakes in shallow plate. 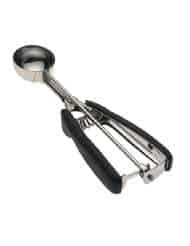 Using a smallcookie scoop the scoop the mixture and roll around in your hands to create even balls. 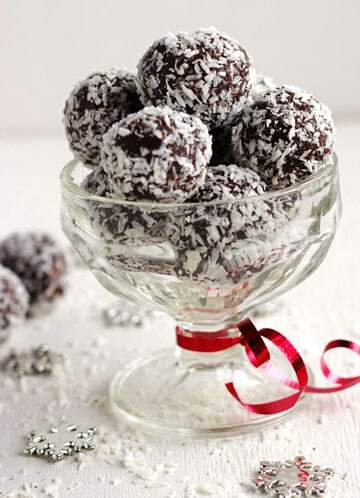 Roll each ball around in the coconut flakes and place on the prepared cookie sheet. I’m intrigued by all of this avocado in baking talk… I think I’m going to have to give it a try! These look so delicious! Do you typically just replace whatever amount of butter you would use with equal parts avocado? Or isn’t it that easy? Thanks Chris! You gotta try it! I honestly have never tried subbing avocado in someone else’s recipe where the amount of butter is already specified, just in things I create. I tend to develop baked goods by weight and then figure out how the weights of ingredients translate to normal meaurments if that makes sense. However, butter and avocado are both solids and I imagine would be pretty close weight-wise so it probably works pretty well to sub them directly! If you try it let me know! 🙂 sorry, I hope that was kind of helpful! 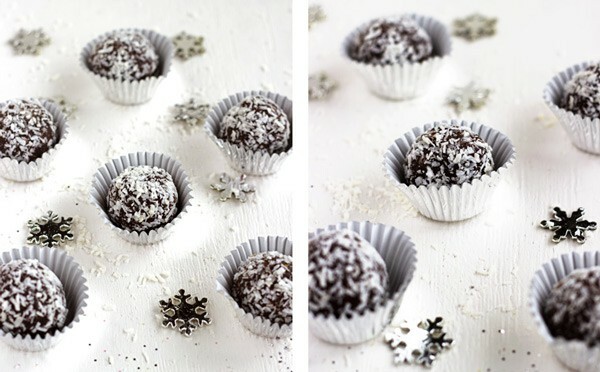 These avocado protein chocolate balls look gorgeous – a wonderful gift idea indeed! Loving your photography!! Sooooo wintery and pretty! 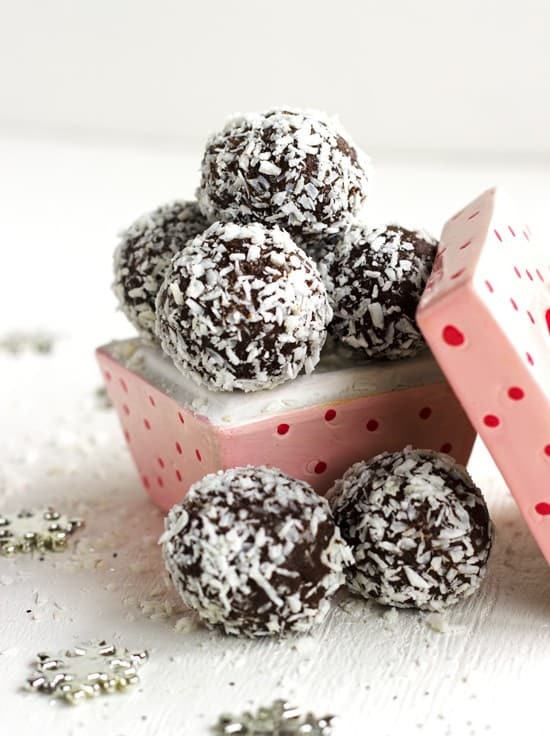 Great job using the avocado in these truffles, I always love the creaminess it adds in! Looks good 🙂 Feeling really hungry now! Actually avocados are a good source of healthy fats. Most of the fats that they contain are unsaturated fats and so are good for you! Ohhhheeeeeemgeeeeeee these look amazing. I want one right now!! 😉 Love the photos, girl! Wow, these are so cute and they look amazing! I’m a sucker for all things avocado, truffles, and almond joy. I’m so glad I found your blog! 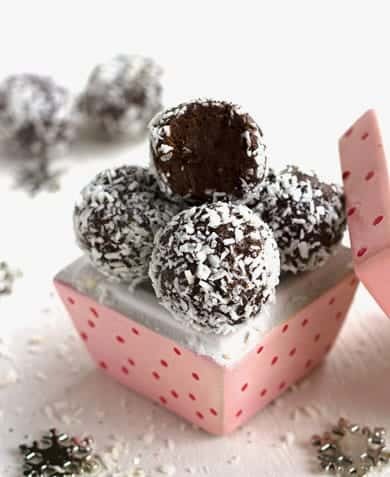 I love love love using avos in baked goods and will have to try them in these no bake truffles. Haha, I would so eat these for breakfast! Thanks for sharing! These look delish! I will definitely be making them this Christmas! If I omit the protien powder will it alter that taste much?? Just found your blog and it’s exactly what I’ve been looking for! Everything looks amazing! I will be baking (and tasting) all day. sounds interesting, must try but what exactly is the chocolate protein powder and where do I find it? Is it the chocolate protein powder you use to make protein shakes with? any brand will do? Hi Laura! Thank you so much for your kind words, I really appreciate them! 🙂 I love meeting fellow bloggers and Christ followers! Can’t wait to check out your blog! I came across your recipe on Pinterest and gave it a try around christmas time. Big hit! tested it with my kids and they totally approve. Thanks for sharing. Ok, can I just say WOW! Almond Joy is my favorite candy bar and if I could somehow make that healthy my life would be complete. Pinning and purchasing avocado at the store tomorrow. Thanks for sharing. Thanks Danita! These are TOTALLY for you too – even my husband eats them! 🙂 Let me know if you try them please! I made these today. I’ve never had avocado and was a little scared. But they are delish! One thing, they would not firm up! I left them in the fridge for longer than the 2 hours. Used more then the 1/2 cup coconut and put them back in the fridge and they are still a goopy mess. Any idea what I did wrong? Or what I can do next time to fix this? Okay so I remade them today and, unfortunately, mine were perfect and set up really nice. So I am not sure what went wrong. Did you see protein powder or cocoa powder?? No, definitely peel the avocado!! You don’t want any skin in it! Also, I did use Casein protein powder, which is slightly thicker! If you have some, that could work too! I am sorry it didn’t work out for you! I hope that those tips helped! Do these need to stay refrigerated? I’d love to send these to my cousin who is gluten-free. But they’d have to withstand a few days of shipping. Thoughts? Unfortunately, they definitely need to stay refrigerated, or else they won’t stay firm. I’m sorry! Hi! These look delicious! But I do think it’s important to add even though there is no sugar added, the chocolate chips do add a decent amount of actual sugar. 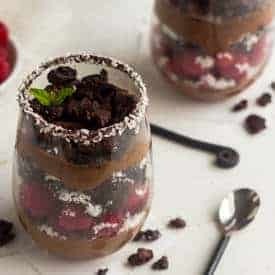 I plan on making these using dark chocolate and maybe mixing some dates in with the avocado in my vitamix to see what kind of results I can get with less sugar. Also, the sweetened coconut also adds sugar. You can use unsweetened instead. I would not necessarily call these healthy with all the added refined sugar. Would have never thought of pairing avocado and chocolate. They definitely look amazing. Thank you so much Suzanne, I hope you had a great weekend!